The Our Lady of Guadalupe Adoration Chapel at St. John the Evangelist Catholic Church in Loveland is a beautiful and quiet place to spend time with our Lord and Savior Jesus Christ. Scroll down for chapel hours and location. Adoration of the Blessed Sacrament is an extension of the Mass and is an homage of the spirit to the King of Glory, in respectful silence. 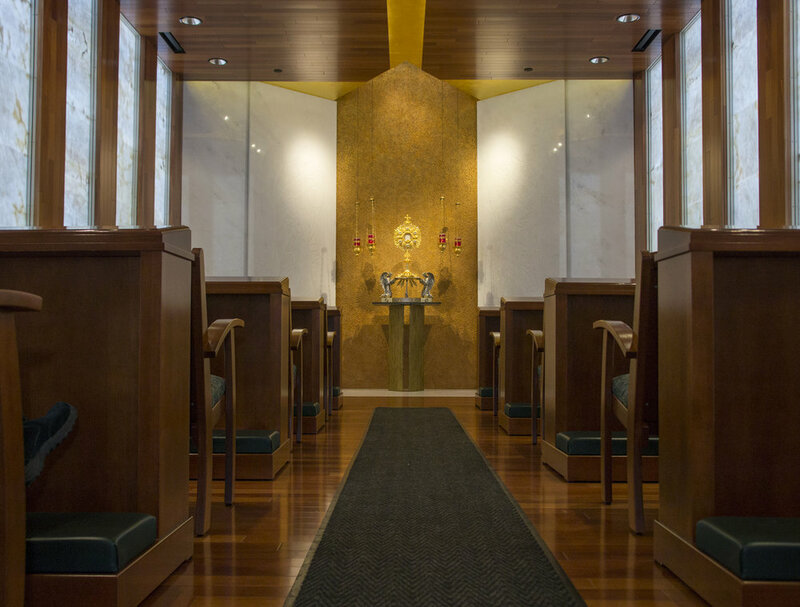 Our Lady of Guadalupe Adoration Chapel was dedicated by Archbishop Aquila on December 22, 2013 and opened for perpetual adoration on March 25, 2014 - the Solemnity of the Annunciation. To learn more about the chapel's history and the theology incorporated into the design, please see a printed sheet that can be found at the entrance to the chapel. The easiest way to access the Adoration Chapel is from the alley behind the church that runs between Hilltop Drive to W. 12th Street. From there you will find designated parking spaces for adorers. The Adoration Chapel offers perpetual adoration 24 hours/day, 7 days/week. The chapel is open to visitors daily from 8am-4pm. If you would like to visit the chapel outside of those hours, please call (970) 635-5822 for a recording with additional instructions.